Cute, well made, packaged well. Very well made. Love purchase. Halloween themed origami bouquet. You can request your custom bouquet today. Origami art from Graceincrease was published on the MUSE magazine. Sit back and enjoy the breathtaking paper art that are delightful to give or receive. Hello, I am Erika from Graceincrease. I am an origami artist from Japan. I offer customized origami art for events, and special occasion gifts. My mission is to create breathtaking art, so you can host the most amazing event with ease. That is why I developed creaseless wings method™, a new and special folding method to highlight the natural shape of the origami cranes. Origami cranes from Graceincrease do not have the folding lines in the middle of their wings. I have also come up with a special way to package origami garlands, so your origami garlands will arrive tangle-free, and unboxing and displaying is a breeze. I fold every single origami art that is offered from with care. I will be honored to create my next origami art piece for you. I am always developing the next origami art product for you. I am a Japanese origami artist who lives in Florida, U.S. I love to put a smile on someone's face with my origami art. When origami cranes' wings are opened wider, their wingspan will become larger. Above measurements are for half-opened origami cranes. 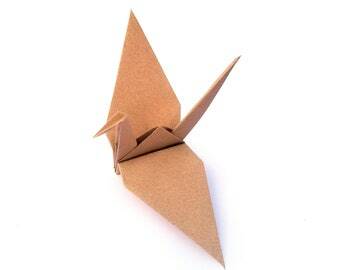 Please refer to the following link for the half-opened origami crane shape. Please refer to "Shipping & Policies" inside your desired item. "Shipping & Policies" tab is located underneath listing images. Rush Order Upgrade is available for customers who would like to receive their order quickly. Please contact me to request a quote for your Rush Order Upgrade. *Rush Order Upgrade is Available. Please contact me for a quote. Rush order upgrade is available for customers who would like to receive their orders quickly. Please contact me for a quote for your rush order upgrade. I offer first-class mail, priority mail, and priority mail express. UPS shipping is available upon request. Please contact me prior to placing your order to request UPS shipping. For international customers, I offer first class international, priority mail international, and priority mail express international. What if I do not see the color I want? I am happy to create custom order for you. Please contact me to request a custom order. To add gift message to any of your order, please write your gift message inside "not to seller" during the check-out process. How will my origami cranes be shipped? Your origami cranes will be shipped with their wings closed to protect their wings. Their wings are very easy to open. The instruction on how to open their wings are included in every origami crane orders. 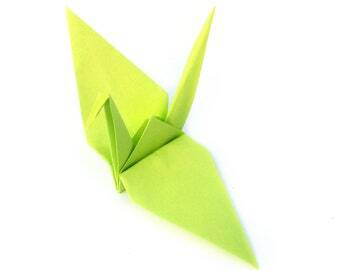 Small size and medium size origami cranes may be shipped with their wings opened. Please leave a note to seller to request your small size and medium size origami cranes to be shipped with their wings opened.